Epoxy coatings are extremely durable and UV resistant, useful for indoors and out. Coated concrete becomes waterproof, stain-resistant and can also be made chemical resistant. Epoxy flooring is economical, especially for large commercial spaces and certainly when you consider ease of maintenance. Slip-resistant coatings are available where liquids or slopes are involved. Colors and patterns are available in a wide variety, suitable for any desired color scheme or design plan. Coved flooring is possible where needed for sanitation and wall protection. Turnaround time for epoxy flooring is short, limiting downtime for your business during remodels and allowing for faster construction schedules with new buildings. Where Should Epoxy Flooring be Used? Health and fitness clubs use epoxy flooring for pool areas, locker rooms, bathrooms and courts. Hospitals and rehabilitation facilities benefit from epoxy flooring for easy cleaning and maintenance with no-slip surfaces. Restaurants use coated concrete to limit stains and hazards in kitchen and storage areas. Repair shops apply epoxy coatings to concrete floors to prevent oil buildup and dangerous falls. Technical companies appreciate coated concrete since it repels dust and encourages a clean working environment. Epoxy flooring offers many different design options for retail spaces and is an excellent choice for warehouse or inventory areas. 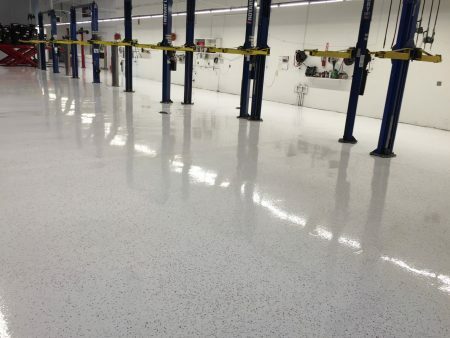 Let California Custom Coatings lend its exceptional experience with commercial concrete flooring to your business. Our free consultation is handled promptly and at your convenience and our quotations are honest and competitive. We encourage you to view the Gallery on our website to see how epoxy flooring can help your workspace stand out from the competition. Call California Custom Coatings at 916-612-2399 or contact us online for any size service in Sacramento and Northern California, and for larger projects in Southern California. quoted a long wait because mine was a small job. John started the job right away. The job was finished quickly. John even came out at 7 PM to ensure the job was finished as promised. Best of all the room looks great and the coating is perfect!